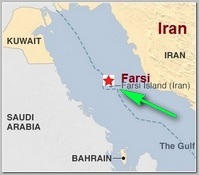 On Tuesday 01/12/2016 gulf time Iran seized 2 small USA Navy boats, with 10 sailors on boards, on a patrol mission from Kuwait to Bahrain, near the Iranian claimed Farsi Island just in the middle of the Arabian/Iranian Gulf, three days before the scheduled date to lift the sanctions imposed on Iran and almost simultaneously with Tuesday final State of the Union address of President Barack Obama, on Tuesday 01/12/2016 Washington time,. Iran aired humiliating footage of the American Navy Sailors surrendering with hand up. The American staff was released after few hours after a Navy sailor apologised for their “mistake” and thanks the Iranians for their ‘hospitality’. In the hours after the seizure of the Americans became public on 01/12/2016 there were conflicting reports about what caused the sailors to stray off their intended course. Monday’s official account did not explain the reason. It said only that the crews “deviated” from their planned course. It made no reference to the navigation error . Indeed in its first official account of Iran’s seizure and subsequent release of 10 U.S. sailors in the Persian Gulf, the U.S. military said, a week later on Monday 01/18/2016, the only items found missing from their two recovered boats were SIM cards for two satellite phones. The report said that along the approximately 50-mile journey they were to have refueled by linking up with a U.S. Coast Guard vessel, the Monomoy, in international waters. The timeline said that approximately 10 minutes after the scheduled refueling, Central Command’s naval headquarters at Bahrain received a report that the boats were being questioned by Iranians. About 19 minutes later, the naval headquarters “was advised of degraded communications with” the two boats, the account added. After an additional 26 minutes, the naval headquarters was notified of a total loss of communications with the boats. ** NOTE – It must be mentioned that the American patrol boats are fully capable to drag each other for long distance, both have a double navigation system to overcome electronic or physical failures. both are in constant connection with their operational base and under constant remote supervision. They and their base of operation are also especially equipped to detect from several dozens of k”m suspicious or hostile objects. The only way Iran could to seize the two boats simultaneously and by surprise is to ‘blind’ the American electronic navigation and communication systems like they did with the UAV spy plane RQ-170, known as the “Beast of Kandahar” on 12/04/2011 .